Sponsored by Intact Vascular, Inc. Discussion on the prevalence of post-angioplasty dissections, guidelines for their identification, and the use of the Tack Endovascular System® for repair. Dissection is the mechanism of action for balloon percutaneous transluminal angioplasty (PTA), the cornerstone of all endovascular intervention. PTA works through adventitial stretching and controlled dissection of the target lesion (Figure 1).1 The extent of post-PTA dissection can widely vary, from local plaque rupture to severe flow-limiting dissection. The extent of dissection and the development of hemodynamic alterations in vessel flow are major determinants of both acute procedural complications (eg, need for bailout therapies) and future rates of restenosis. Understanding the prevalence, identification, and classification of dissections is therefore paramount to identifying optimal treatment strategies in both the superficial femoral artery (SFA) and infrapopliteal arteries. Figure 1. Mechanism of action for post-PTA dissection. Balloon angioplasty uses distortional stress to increase luminal gain (A). Resulting dissections range in severity (B), many requiring treatment. Current data suggest that drug-coated balloon (DCB) angioplasty is associated with rates of dissection similar to those of standard PTA, but it is difficult to extrapolate the results of these studies to real-world practice, where lesions tend to be longer, calcified, and more often occluded. In real-world registries, the rates of bailout stenting range from 20% to 40%,8,9 suggesting higher rates of operator-determined severe dissections that necessitated stent implantation. Recent data have demonstrated the clinical impact of dissections after PTA. In a large multicenter study, Fujihara et al studied 748 de novo SFA lesions.2 After initial balloon dilation, 84% of lesions demonstrated some type of angiographic dissection. As a result, stent implantation was performed in the majority of lesions. Among the 193 lesions treated with balloon angioplasty alone, the association was studied between final dissection grade and subsequent restenosis. Severe dissections (characterized as type C or greater) occurred 42% of the time and were associated with significantly increased rates of restenosis and target lesion revascularization (TLR), with a stepwise relationship between dissection severity and outcomes. In another study, Kobayashi and colleagues studied 319 de novo SFA lesions treated with balloon angioplasty.3 After balloon angioplasty, 75% of lesions had evidence of angiographic dissection. In their analysis, mild dissections (< one-third of the vessel lumen) were not associated with restenosis among lesions < 100 mm, but even mild dissections were associated with restenosis if the treated lesion was > 100 mm in length. More severe dissections were associated with decreased primary patency independent of lesion length. These findings suggest that even mild dissections may affect vessel patency, especially among longer lesions. The outcomes of dissections after DCB angioplasty remain an active area of investigation. Because most randomized trials excluded enrollment if initial balloon angioplasty resulted in a severe dissection, limited data are available on the natural history of dissections after DCB angioplasty without provisional stent placement. Although DCB angioplasty has been shown to reduce the rates of neointimal hyperplasia and restenosis, the biologic effect of paclitaxel on dissection healing is unclear. For example, the reduction in neointimal hyperplasia with DCB angioplasty may limit the association of small intimal tears with restenosis. Alternatively, the presence of paclitaxel likely has no impact on torn tissue and plaque in the flow lumen, so it is unclear whether it has an effect on long-term patency and/or the potential for vessel thrombosis. Such hypotheses need to be confirmed in large cohort studies. Dissections occur after almost all balloon angioplasty procedures regardless of the type of balloon used. The prevalence and clinical outcomes of post-PTA dissections have only recently been described and have gained increasing prominence in the operator’s decision of whether an acceptable acute result has been achieved. Emerging data suggest that all dissections matter and that dissections significantly impact clinical outcomes after infrainguinal endovascular intervention. The concept of leaving as little metal behind as possible is gaining ground given the neointimal hyperplasia associated with stenting; however, there is still a need for a better method of treating dissection. The development of novel therapies, such as the Tack Endovascular System® (Intact Vascular, Inc.), may create the opportunity for focal dissection repair without the disadvantages of conventional stent implantation. Tack Endovascular System® is limited by Federal (United States) law to investigational use. Not approved for sale in the United States. Tack Endovascular System® is CE Mark authorized under EC Directive 93/42/EEC. Tack Endovascular System® and Tack® are registered trademarks of Intact Vascular, Inc.
1. Gasser TC, Holzapfel GA. Modeling plaque fissuring and dissection during balloon angioplasty intervention. Ann Biomed Eng. 2007;35:711-723. 2. Fujihara M, Takahara M, Sasaki S, et al. Angiographic dissection patterns and patency outcomes after balloon angioplasty for superficial femoral artery disease. J Endovasc Ther. 2017;24:367-375. 3. Kobayashi N, Hirano K, Yamawaki M, et al. Simple classification and clinical outcomes of angiographic dissection after balloon angioplasty for femoropopliteal disease. J Vasc Surg. 2017;67:1151-1158. 4. Razavi MK, Mustapha JA, Miller LE. Contemporary systematic review and meta analysis of early outcomes with percutaneous treatment for infrapopliteal atherosclerotic disease. J Vasc Interv Radiol. 2014;25:1489-1496. 5. Fanelli F, Cannavale A, Corona M, et al. The DEBELLUM–lower limb multilevel treatment with drug eluting balloon–randomized trial: 1-year results. J Cardiovasc Surg (Torino). 2014;55:207-216.
preliminary experience in patients with peripheral vascular disease. Radiology. 1990;175:61-70. 7. Shammas NW, Torey JT, Shammas J. Dissections in peripheral vascular interventions: a proposed classification using intravascular ultrasound. J Invasive Cardiol. 2018;30:145-146. 8. Micari A, Brodmann M, Keirse K, et al. Drug-coated balloon treatment of femoropopliteal lesions for patients with intermittent claudication and ischemic rest pain: 2-year results from the IN.PACT global study. J Am Coll Cardiol Interv. 2018;11:945-953. 9. Kokkinidis DG, Jeon-Slaughter H, Khalili H, et al. Adjunctive stent use during endovascular intervention to the femoropopliteal artery with drug coated balloons: insights from the XLPAD registry [published online June 1, 2018]. Vasc Med. Disclosures: Consultant/advisory board for Abbott Vascular, Boston Scientific Corporation, Cardiovascular Systems, Inc., Intact Vascular, Inc., and Philips. Another major challenge with dissections is that even once identified, their severity is underestimated. The TOBA study by Bosiers and colleagues found that physicians reported National Heart, Lung, and Blood Institute (NHLBI) dissection grades ≥ C in only 25.8% of patients, compared with an independent core laboratory analysis in which grades ≥ C were present in 74% of patients.8 This illustrates a significant gap in both the ability to recognize and classify the presence of dissections after intervention. Figure 1. Femoropopliteal dissection grading. In the NHLBI grading system, dissections are graded A–F. An A dissection includes minor radiolucent areas; a B dissection is a linear dissection, typically on both sides of the vessel; a C dissection includes contrast outside of the flow lumen; a D dissection is a spiral pattern; an E dissection includes persistent filling defects; and an F dissection involves total occlusion without distal antegrade flow. Courtesy of Prof. Marianne Brodmann. The NHLBI system, although useful for categorization, has several limitations. Initially developed for the coronary arteries, this system does not apply to the large diameters and long lesions in the femoropopliteal arteries. There is a corresponding lack of consensus as to what constitutes a severe dissection, as demonstrated in recent DCB trials.11,12 Although many physicians consider a grade C or greater dissection as severe, and therefore necessitating further treatment, additional data are necessary to determine the appropriate threshold for dissection treatment. Furthermore, the NHLBI system considers only the most severe dissection in a lesion, although multiple dissections may occur along a single treatment area. Notably, this classification does not account for other factors, such as length, depth, and arc of injury, that may be additive in the subsequent risk of restenosis. For these reasons, an updated and improved classification system is necessary for the study of dissections in the infrainguinal arteries. 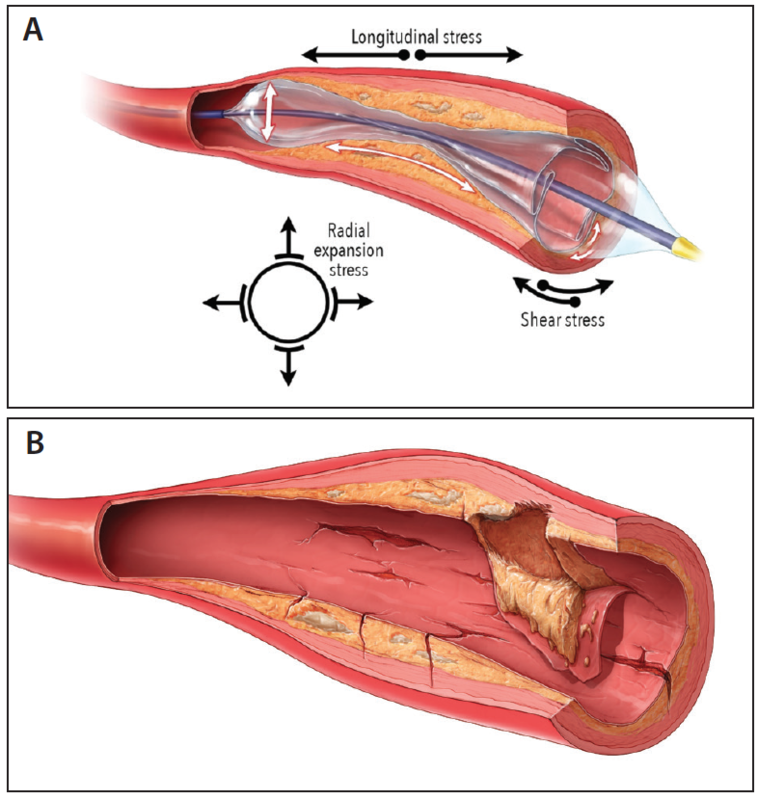 Pathologic studies have shown that deeper injuries into the media and adventitia correlate with loss of patency and increased TLR.13,14 Wider dissections (> 50% of vessel circumference) are more likely to create flow limitation and loss of initial lumen gain. It is unclear whether wider dissections underappreciated by angiography contribute to loss of patency. Figure 2. Intravascular ultrasound iDissection grading. In the iDissection grading system, dissections are graded by both depth and arc of injury. A, B, or C denotes that the dissection extends into the intima, media, or adventitia. Injury that spans < 180° is labeled 1, and 2 denotes injury that involves ≥ 180°. Ideally, an imaging-based dissection grading system should be both easily reproducible and quickly performed during interventional procedures. It should also accurately define the presence, depth, and extent of injury to effectively guide treatment. The recently published iDissection grading system was developed for this purpose.5 It outlines six grades of dissections based on depth and circumference of injury as revealed on IVUS (Figure 2). The iDissection pilot study was designed to determine quantitative differences in postintervention dissection number and severity on IVUS versus contrast angiography using the iDissection and the NHLBI grading systems, respectively.18 Fifteen patients with de novo or nonstented stenotic lesions in the femoropopliteal arteries underwent atherectomy followed by adjunctive PTA. Atherectomy was performed with Jetstream (Boston Scientific Corporation) or B-laser (Eximo Medical Ltd), adjunctive angioplasty was performed with Lithoplasty (Shockwave Medical, Inc.) in one-third of patients, and DCB in all patients. Angiographic and IVUS imaging (Eagle Eye Platinum ST, Philips) of the same segment were performed at baseline, postatherectomy and postadjunctive PTA. All images were adjudicated by independent core laboratories. Mean lesion length was 10.8 cm and treated length was 16.2 cm. Peripheral artery calcification scoring system (PACCS) grade 3 and 4 calcification was present in 20% and 40% of patients, respectively. Limb ischemia with ulceration was present in 26.7% of patients. Postatherectomy intramural hematoma was present in 13% of patients on IVUS, yet not visualized on multiplanar angiography. Additionally, there were a total of 46 dissections on IVUS compared with eight dissections on angiography. These data challenge the widely held belief that vessel preparation with atherectomy does not produce dissections. After adjunctive PTA, IVUS showed 39 dissections to 11 with angiography, suggesting that adjunctive angioplasty does not mitigate the excisional trauma caused by atherectomy. The iDissection pilot study demonstrated that IVUS revealed four to six times more dissections overall when compared with angiography, and nearly 40% of these dissections extended into the media and/or adventitia. Although longer lesions correlated with more dissections, there was no apparent predictor for dissections exceeding 180° in circumference. More research is needed to determine how these deeper and wider dissections may result from or interact with current therapies. Precision imaging during endovascular therapy is critical to assess the severity of lower extremity occlusive disease, guide appropriate device selection, and secure a successful clinical outcome. The ability to identify the presence and extent of postintervention dissections will help design studies to more clearly investigate the role of dissections in clinical outcomes and how some technologies such as the Tack Endovascular System® might be utilized in dissection repair. Note: The Tack Endovascular System® has not been studied for the repair of dissections caused by atherectomy. Tack Endovascular System® is limited by Federal (United States) law to investigational use. Not approved for sale in the United States. Tack Endovascular System® is CE Mark authorized under EC Directive 93/42/EEC. 1. Korogi Y, Hirai T, Takahashi M. Intravascular ultrasound imaging of peripheral arteries as an adjunct to balloon angioplasty and atherectomy. Cardiovasc Interv Radiol. 1996;19:1-9. 2. Arthurs ZM, Bishop PD, Feiten LE, et al. 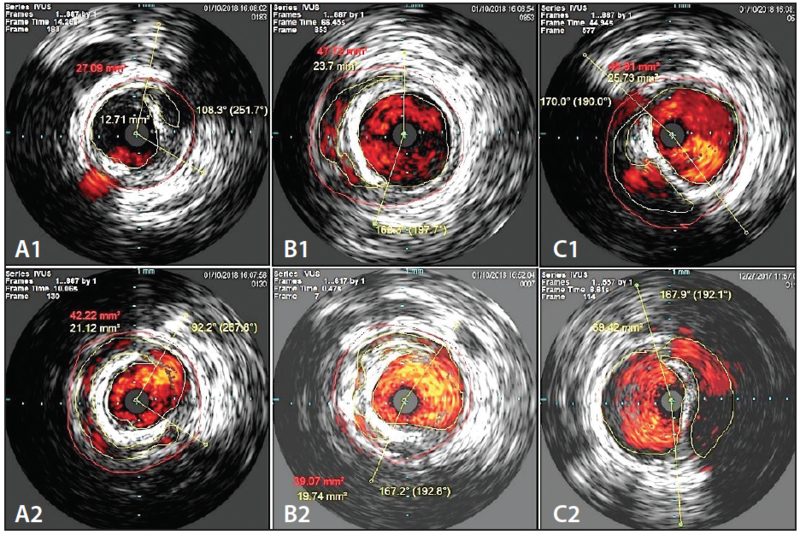 Evaluation of peripheral atherosclerosis: a comparative analysis of angiography and intravascular ultrasound imaging. J Vasc Surg. 2010;51:933-939. 3. Mintz GS, Popma JJ, Pichard AD, et al. Patterns of calcification in coronary artery disease: a statistical analysis of intravascular ultrasound and coronary angiography in 1155 lesions. Circulation. 1995;91:1959-1965. 4. Pandian NG, Kreis A, Brockway B, et al. Intravascular high frequency two-dimensional ultrasound detection of arterial dissection and intimal flaps. Am J Cardiol. 1990;65:1278-1280. 5. Shammas NW, Torey JT, Shammas WJ. Dissections in peripheral vascular interventions: a proposed classification using intravascular ultrasound. J Invasive Cardiol. 2018;30:145-146. 6. Krishnan P, Tarricone A, Ali Z, et al. Intravascular ultrasound is an effective tool for predicting histopathology-confirmed evidence of adventitial injury following directional atherectomy for the treatment of peripheral artery disease. J Endovasc Ther. 2016;23:672-673. 7. Iida O, Takahara M, Soga Y, et al. Efficacy of intravascular ultrasound in femoropopliteal stenting for peripheral artery disease with TASC II class A to C lesions. J Endovasc Ther. 2014;21:485-492. 8. Bosiers M, Scheinert D, Hendriks JMH, et al. Results from the Tack Optimized Balloon Angioplasty (TOBA) study demonstrate the benefits of minimal metal implants for dissection repair after angioplasty. J Vasc Surg. 2016;64:109-116. 9. National Heart, Blood and Lung Institute. Coronary artery angiographic changes after PTCA. In: Manual of operations: NHLBI PTCA registry. Bethesda (MD): National Heart, Lung, and Blood Institute; 1985:6-9. 10. Kobayashi N, Hirano K, Yamawaki M, et al. Simple classification and clinical outcomes of angiographic dissection after balloon angioplasty for femoropopliteal disease. J Vasc Surg. 2017;67:1151-1158. 11. Laird JR, Schneider PA, Tepe G, et al. Durability of treatment effect for using a drug-coated balloon for femoropopliteal lesions: 24-month results of IN.PACT SFA. J Am Coll Cardiol. 2015;66:2329-38. 12. Rosenfield K, Jaff MR, White CJ, et al. Trial of a paclitaxel-coated balloon for femoropopliteal artery disease. N Engl J Med. 2015;373:145-153. 13. Tarricone A, Ali Z, Rajamanickam A, et al. Histopathological evidence of adventitial or medial injury is a strong predictor of restenosis during directional atherectomy for peripheral artery disease. J Endovasc Ther. 2015;22:712-715. 14. Fujihara M, Takahara M, Sasaki S, et al. Angiographic dissection patterns and patency outcomes after balloon angioplasty for superficial femoral artery disease. J Endovasc Ther. 2017;24:367-375. 15. Shammas NW, Lam R, Mustapha J, et al. Comparison of orbital atherectomy plus balloon angioplasty vs. balloon angioplasty alone in patients with critical limb ischemia: results of the CALCIUM 360 randomized pilot trial. J Endovasc Ther. 2012;19:480-488. 16. Shammas NW, Coiner D, Shammas GA, et al. Percutaneous lower-extremity arterial interventions with primary balloon angioplasty versus Silverhawk atherectomy and adjunctive balloon angioplasty: randomized trial. J Vasc Interv Radiol. 2011;22:1223-1228. 17. Dattilo R, Himmelstein SI, Cuff RF. The COMPLIANCE 360° trial: a randomized, prospective, multicenter, pilot study comparing acute and long-term results of orbital atherectomy to balloon angioplasty for calcified femoropopliteal disease. J Invasive Cardiol. 2014;26:355-360. 18. Shammas NW, Torey JT, Shammas GA, et al. Intravascular ultrasound assessment and correlation with angiographic findings demonstrating femoropopliteal arterial dissections post atherectomy: results from the iDissection study. J Invasive Cardiol. 2018;30:240-244. Disclosures: Receives research and educational grants from Boston Scientific Corporation, Bard Peripheral Vascular, and Intact Vascular, Inc. Figure 1. Designed for focal treatment of post-PTA dissections above and below the knee, the Tack Endovascular System® is preloaded with multiple implants on a single catheter. The Tack Endovascular System® is purpose-built for the treatment of peripheral arterial dissections that occur postangioplasty, whether above the knee (ATK) or below the knee (BTK). It is designed to offer focal treatment with minimal metal, optimizing PTA outcomes while preserving vessel mechanics and future treatment options (Figure 1). The system includes multiple preloaded, self-expanding nitinol Tack® implants on a single catheter designed for precise delivery to the treatment area. For ATK interventions, each of the six Tack implants can treat a wide range of vessel diameters from 2.5 to 6 mm. For BTK, there are four Tack implants that treat vessels from 1.5 to 4.5 mm in diameter. Both the ATK and BTK implants (Figure 2) are approximately 6 mm in length when deployed and feature gold radiopaque markers for increased visibility during fluoroscopy, as well as anchors that are designed to prevent migration. Figure 2. BTK and ATK Tack implants. Approximately 6 mm in length, the Tack implant is a first-of-its-kind dissection repair device designed to treat only where dissections are present. The Tack implant’s Adaptive Sizing™ technology offers the ability to treat multiple dissections within a single intervention, eliminating the need for precise device sizing and multiple catheter exchanges. A key Adaptive Sizing feature is the low radial outward force applied to the vessel wall by the Tack implant. This force remains relatively constant across a wide range of vessel diameters, allowing the Tack implant to fit a range of vessel sizes. This eliminates the need to precisely size the device to the diameter of the vessel. Compared with the much higher radial forces exerted by traditional stents, the Tack implant’s low radial force does not activate the proliferative inflammatory response and neointimal hyperplasia that leads to in-stent restenosis. The metal burden of the Tack implant is 70% to 80% less than stents used to treat a similar dissection.1 This avoids the need to cover healthy tissue, preserving normal vessel movement, and allows for additional treatment in the future with no bridges burned. A 67-year-old woman, Rutherford class 3, presented with an 18-cm lesion of the SFA including a 19-cm occlusion (Figure 3A). After predilatation and DCB angioplasty were performed, the post-PTA result was evaluated for the presence of dissection. The use of higher magnification and multiple angles with angiography is recommended, especially if intravascular imaging such as IVUS or OCT is unavailable. A grade D dissection was noted at the middle segment in addition to grade C dissections at the proximal and distal end (Figure 3B). To treat the dissections, the delivery system was advanced over the guidewire and positioned at each intended deployment site. Each Tack implant was released by withdrawing the outer sheath in “pin-and-pull” fashion, moving from the most distal dissection proximally. Six Tack implants were deployed (Figure 3C). The implants were then postdilated to seat the anchors and ensure apposition to the vessel wall, followed by final angiography (Figure 3D). Figure 3. Case example from Westküstenklinikum, Heide, Germany. A long SFA occlusion (A) was treated with angioplasty, resulting in multiple severe dissections (B). Six Tack implants were placed with resolution of the dissections (C). The final angiogram after postdilation of Tacks showed no residual dissection (D). 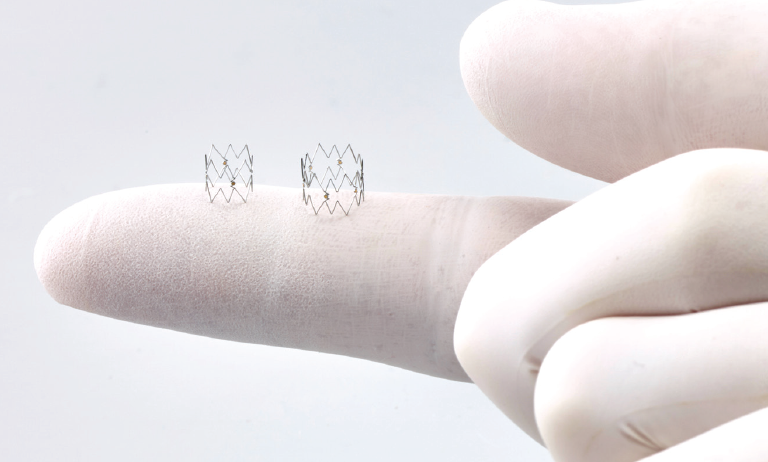 TOBA II, a pivotal investigational device exemption (IDE) study, studied the Tack Endovascular System® after either standard or Lutonix 035 DCB (BD Interventional) angioplasty. The balloon choice was at the discretion of the operator. 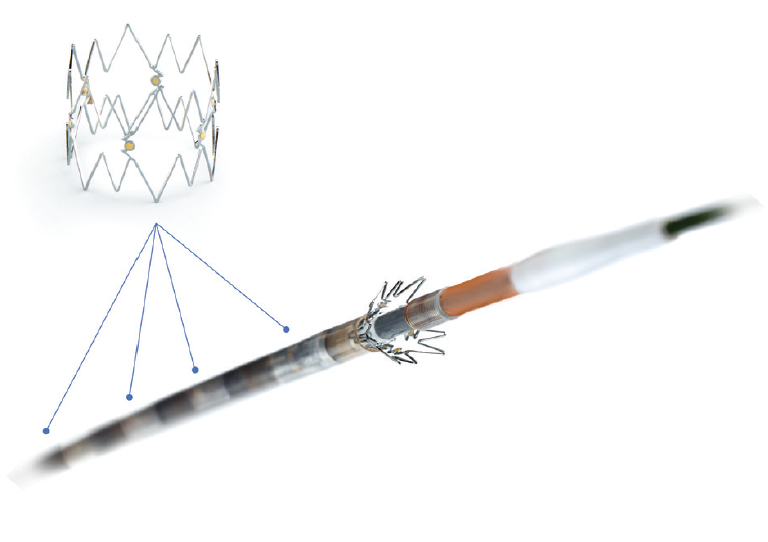 TOBA III, a post–CE Mark approval study, investigated dissection repair with Tack implants after In.Pact Admiral (Medtronic) angioplasty, including a subset of patients with longer lesions between 15 and 25 cm. Both studies have completed enrollment. The 12-month data from TOBA II are anticipated to be released in late 2018. 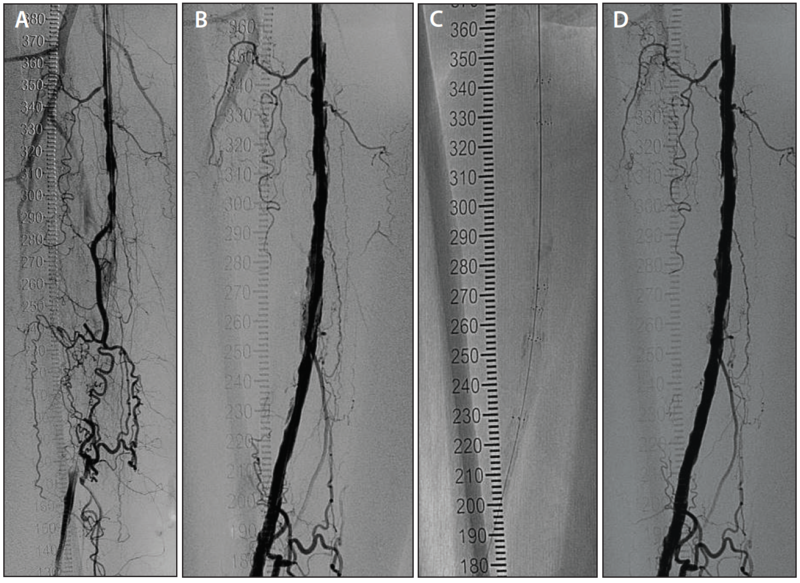 TOBA II BTK is the pivotal IDE study of the Tack Endovascular System® in the treatment of patients with infrapopliteal disease and critical limb ischemia. The trial is enrolling rapidly in the United States, Europe, and New Zealand and will analyze primary endpoints at the 6-month time frame. With the Tack Endovascular System®, minimal metal and low radial force present a new scaffolding paradigm with focal treatment of postangioplasty dissections. In keeping with the progressive nature of peripheral artery disease, future treatment options, both endovascular or surgical, are preserved. 1. Bosiers M, Scheinert D, Hendriks JM, et al. Results from the Tack Optimized Balloon Angioplasty (TOBA) study demonstrate the benefits of minimal metal implants for dissection repair after angioplasty. J Vasc Surg. 2016;64:109-116. 2. Wissgott C. 2-Year Results of the TOBA Trial for fempop lesions demonstrates safety and efficacy of the Tack endovascular system in repairing focal post-PTA dissections. Presented at: Leipzig Interventional Course (LINC) 2018; January 30–February 2, 2018; Leipzig, Germany. 3. Brodmann M, Wissgott C, Holden A, et al. Treatment of infrapopliteal post-PTA dissection with Tack implants: 12-month results from the TOBA-BTK study [published online March 24, 2018]. Catheter Cardiovasc Interv. Disclosures: Consultant to Intact Vascular, Inc.
Not all superficial femoral artery device trials are created equal—in fact, none are. A discussion on the current role of vessel preparation, when to use it and when not to use it, device selection, and data related to cost-effectiveness and algorithm creation. Experts discuss key elements of SFA trials, whether a global algorithmic approach to treating SFA disease is possible, and the limitations of cross-trial platform comparisons.